This week’s “lets blog off“ creators want to know: What Makes You Laugh? A troop of brilliant blogging buddies aim to make you giggle today. You can link to all of our posts here. and I posted the most recent list at the end of this post – a laugh-fest! 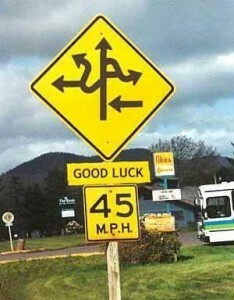 Do you see funny things around your city? 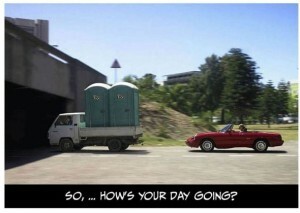 How often do you smile or even laugh out loud in your daily travels? 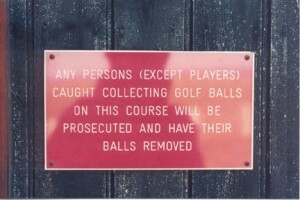 A chuckle here, a smile there means you get it: yeah, that’s funny!! Does your city make you laugh? This little cherub on the Country Club Plaza always makes me chuckle. Bet he’s made more people laugh than most comedians! 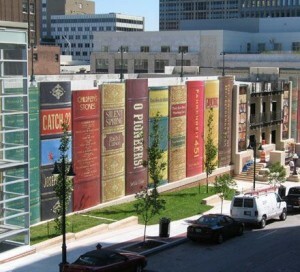 And the parking structure for the downtown Kansas City Public Library is a row of … gigantic books! Surely the architects wanted to make us laugh? A lot of public art cracks me up. This fellow eating a shoe with eyes and ears covered stands blatantly in front of the (believe it or not!) 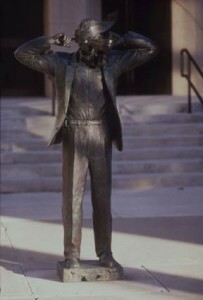 the KC Communication Center. The Shuttlecocks make the venerable Nelson-Atkins Museum of Art their badminton net. Fantastic art/architecture joke. Let’s face it, cities are hilarious! And not in just one way; we have a whole toolbox of humor. A rare few city forefathers invented some rib-cracking names – down the road from me is Peculiar, Missouri, and a little further is Versailles, named for its proud French ancestor. Now that’s not so funny, except we call it “Ver-say-alls.” (Apologies to France!) 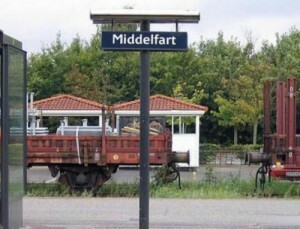 What if you were from Accident, Tightwad, or Middelfart? -makers have a terrific sense of humor. 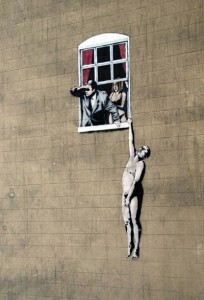 And some graffiti is silly funny…. 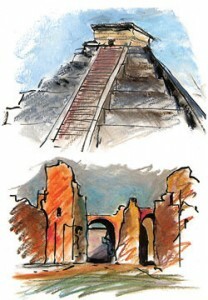 If architecture is the mother art… who is the dad?? Heh. If at first you don’t leap over tall buildings in a single bound… build shorter buildings. Ok, did I mention I can’t tell a joke? I’ll just stick to images! I love those hotdog stands shaped like a hotdog. 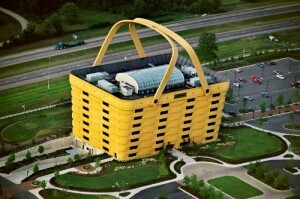 Guess what the owners of this building, the Longaberger Company, sell? 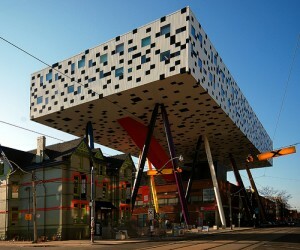 This serious building, the Ontario College of Art and Design, looks a bit like a game board. And finally, the best laugh goes to lunatic driving. The rowdiest 10 secs of driving you’ll ever see. Cities – Why be funny? Now that you think about it, aren’t cities funny? No doubt, cities are very serious places. But sometimes, you just got to have some fun. Humor makes cities more human, more relatable, and sparks everyday life. Kids in a park, dogs chasing birds, monkeys in the zoo, a cherub statue peeing, or a big book building make me laugh. Pink flamingos make me cringe-laugh, thanks to an oldJohn Waters film. Still some folks find them joyful. Laughter shakes off our troubles, lightens the load. Who wants cities full of dark and gloom? That says someone didn’t care enough to make us laugh, to charm us, to brighten life. A city with humor opens communication and creates moments for sharing something good – laughter. Come on Cities, show us some heart. Dare to make us smile or even laugh out loud. That’s the gift of common ground, a shared moment among strangers. We can’t be angry when we’re laughing. We can’t hurt anyone, or rob a store. Ok, we might have a bike or car accident if we laugh too hard. Watch out!! Can a city add a laugh track? 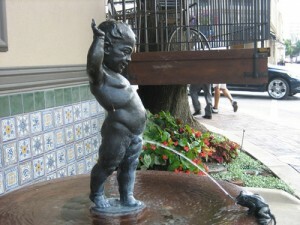 What cities, fountains, places, buildings make you laugh? 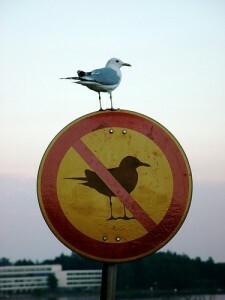 Enjoy many more witty blog posts, and some quite serious, from the extraordinary ”lets blog off” community. Calf at Bike Rack; Ontario College of Art and Design, Toronto by Wil Alsop,Ontario College of Art and Design, Toronto by Wil Alsop,Hummer Coach,Longaberger Company Home Office, Newark Ohio,Bird Sign and Portapotty;Bristol graffiti ;gargoyles at Notre Dame Cathedral, “Modern Communications” by Terry Allen, Nelson AtkinsShuttlecocks by Oldenburg and van Bruggen,“Book” Parking Garage at KC Central Library;town signs. If this were a logical world, MEN would ride horses sidesaddle. heh.